SPORAH TV: FATIMA JABBE TRULY MADE IT TO NOLLYWOOD..! FATIMA JABBE TRULY MADE IT TO NOLLYWOOD..! Back Stage with Fatima Jabbe and The Winners of Miss Congo UK 2011. Again Ladies on last minute touches before filming begins. Fatima Jabbe and Sporah Njau. A Gambian and Sierra Leonean Fatima Jabbe is gracing Nollywood with her first movie “The Mirror Boy” alongside Genevieve Nnaji and Osita Iheme. The movie is a production of The Nollywood Factory and OH Films which had its world premiere last Thursday Feb 24th in London at the Leicester Square Empire. Fatima Jabbe, Genevieve Nnaji, Osita Iheme and Edward Kagutuzi were joined on the red carpet by UK talent including solo artist Keisha Buchanon, Kanya King (MOBO), Eddie Kaddie, Kojo, Guvner B, Egypt, Yolanda Brown, Kele Leroc and many more. Heey..! Welcome to The Sporah Show Fatima. Lovely to meet you Sporah..! I just love her beautiful smile..! Fatima on set with Sporah. TIMA's (as she is commonly known) career break came when she won the MISS AFRO CARIBBEAN 2000. She moved on to become an Event Manager putting together the best shows in the UK and The Gambia. Some of these shows include Face of the Gambia, Women of Excellence Awards, Miss Africa Sub-Region Competition, Miss Afro Caribbean UK, Queen of the Millennium, to name, but a few. During her Role as the Winner of the Miss Afro Caribbean Beauty Competition, she embarked on a lot of charitable roles by putting together the Gambia Meningitis Foundation, the promotion of girls Education in the Gambia through Face of the Gambia, the role of women empowerment through the Women of Excellence Awards. 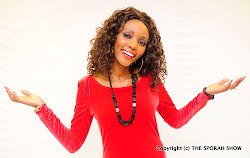 She won the Gathering of Africa's Best 2010 in London (GAB Awards) for her role in Community Development. 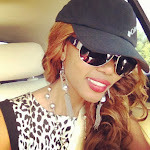 Her first acting role came in 2010 as Queen Fina in the Most Talk about African Film called the Mirror Boy. Thank you for coming on The Sporah Show Fatima..! Check us (The Sporah Show) On face Book and Twitter..! And don't miss out The Sporah Show Every Monday 9:30pm on SKY 184.. BEN TV and Fridays and Saturdays on STAR TV in Tanzania. OKAY..! MY NEXT GUEST WAS PRESIDENT OBONJO..! President Obonjo was born in Liverpool to Nigerian parents. His Dad is from Akure and his Mum is from Warri. President Obonjo arrived in Nigeria in the early 70's and left for the UK in 1985. Obonjo has been home twice since he left but has keept in touch with the state of the nation through social media and his fan base in Nigeria. Obonjo holds a degree in Printing Management but his real passion is Comedy. Welcome to The Sporah Show Sir..! Haha..! He is a true Comedian..! Telling me how he started his career as comedian..! President Obonjo, has been holding sway in the comedy world outside Nigeria, particularly in his country of birth where he currently resides (England). Through his sheer tenacity of purpose in what he knows how to do best, he has undoubtedly taken comedy to another phase through the use of animations, audio/audio-visual displays and other creative graphics all for the entertainment of his teeming fans especially those on Facebook,Youtube and other medium of mass communication. From a recent survey Obonjo has successfully broken the jinx of making comedy only a task that can be exhibited on stage but a brain tasking initiative poised at ameliorating stress in people, to make them unwind irrespective of where they are, be it parties, shows, retreats, seminars, on the internet (facebook), radio, television, print media etc. The only Social media comedian to run for Presidency to meet Obama, Clintion through photoshop, To use Social media to launch a Comedy Career. President Obonjo has become a successful comedian because of his innovative use of the internet to engage with Lafta addicts online. The internet was part of an overall digital strategy that has turned thousands of supporters to embrace obonjomania. Now thousands are hooked on a daily dosage of Lafta and Obonjomania pill. You are guaranteed no side effects but you might be seen laughing out loud on your own after watching a clip or reading a note this could make people think u are going looney, Kolo or MAD. Obonjo has really shaped intellectual comedy and brought it to a home near you by phone, laptop, blackberry , TV and on stage. Obonjo focuses on Political and Social Comedy for the forthcoming elections he has asked Nigerians to imagine the impossible. MMH..! He wanted to interview Sporah Instead. Mh Sporah, Tell us about yourself..? Am serious Sporah, tell us which country are you from..? I just cried tears laughing..! Wow..! Nice to be On President Obonjo's Show.! Ha ha ha..! I Love this guy, he is very talented man. Him again, imitating President Obama..1 That was really funny, i wish i could have more time with him, But..! I have to go, President Obonjo, thanks for coming on The Sporah Show..! Last picture after the Show..! 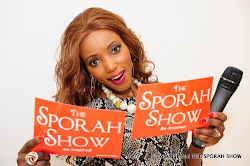 ALL ON THE SPORAH SHOW, MONDAY 25TH JULY 2011..! OOPS! Sporah you did it again, YOUR DRESSSSSSSSSSSSSSSSSSS Sporah. NGRRRRRRRRRR I JUST LOVE IT. I Love Your Look Sporah.... Only someone that cool and confident can rock a dress like that. Sporah napenda sana jinsi unavovaa. WELCOME ME TO MY YOUR WORLD SPORAH. Ilove ur show.i am a public speaker from Egypt but not yet exposed pliz host me one day soon so that i can atleast make a change in pple's lives. hahhaaa,,, LOVE EVERYTHING MY DEAR, yani umenifanya na mimi kucheka mpaka machozi...hahhaaa...stay bless always ""
wow what a pix.. i love sporah show.. they hav 2 continue with more activities..!! !